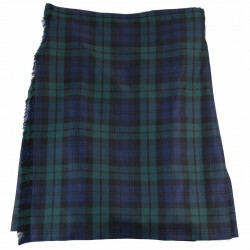 The blackwatch kilt is one of the sure values of the man kilts. The blackwatch tartan is one of the traditional and classic kilts that can be found during Celtic celebrations. The size is adjustable thanks to 2 black belts. The kilt is 100% wool. The Blackwatch tartan is a famous Scottish tartan, consisting of green and blue stripes bordered with black. This tartan refers to the Royal Highland Regiment, the "Black Watch" (Scottish Guard) infantry regiment of the Scottish Highlands. It is best to accompany the kilt of a tweed jacket with horn buttons for the day, or a Barathea-style black wool jacket with silver buttons for evening wear. This article is a special order. Sizes may still be available in our points of sale or delivered within 3 months by our supplier. Contact our Customer Service on 02 98 85 47 37. Please specify the French size when ordering.